A great sign appeared in the sky, a woman clothed with the sun, with the moon under her feet, and on her head a crown of twelve stars. 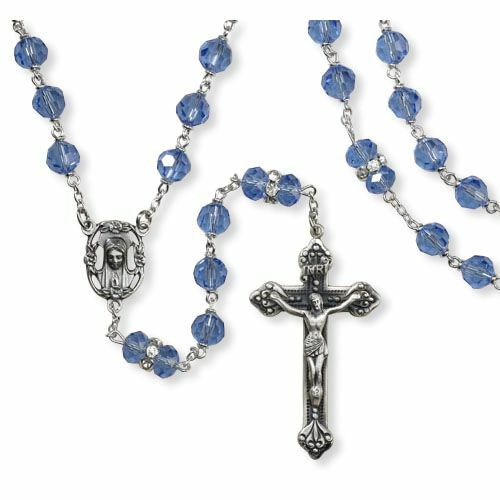 -Revelation 12:1 We are pleased to offer this beautiful new rosary in honor of Our Lady, Queen of Heaven. The Rosary begins with Isaiah sign: The virgin shall be with child, and bear a son, and ends by encouraging us to look to Mary, the woman clothed with the sun. Mary is not only Mother, but Queen of the Universe, reigning now with her Son, rewarded by God for being His most faithful disciple. Size: 8MM Bead, Crucifix 2"